Dimensions (HxWxD): 1.5" x 3" x 1"
These gorgeous hand cut & polished bright blue Lapis bowls have an average diameter of three inches, so it is large enough to hold a small flower or simply water and can be placed on your altar or a display shelf or window sill in your home. 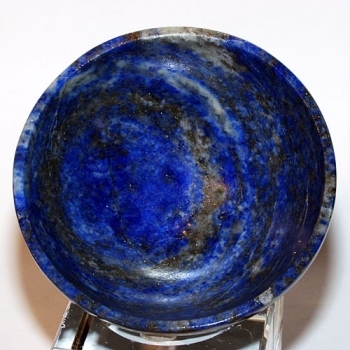 It has a beautiful marble pattern with its ultramarine blue & slate blue which sparkles in the light. It has quite a bit of sparkle to it, visible in the photos here. I have been looking for gem crystal bowls for offerings on our altar for a long time and was thrilled to finally find a wonderful supplier for these beauties, made in India, each piece is unique & amazing. We use them on our altar to hold flowers, water & also to hold small gemstones which we work with in meditation such as phenacite, apatite, topaz, scapalite and tourmalines. Lapis Lazuli means “blue stone”. Lapis is an opaque gemstone, slightly softer than quartz crystal with a strong fluorescence under black lights. Lapis is composed of an amalgam of several minerals: lazurite, augite, calcite, diopside, enstatite, mica, hornblende, nosean, sodalite, and often pyrite. This variable composition results in a wide variety Lapis occurring in colors ranging from deep blue and violet to a greenish-blue. Lapis was a favorite of ancient Egyptian priests and pharaohs, who had skilled artisans fashion amulets of power from this highly prized precious stone. A lapis lazuli gemstone cut in the image of “Mat”, Goddess of Truth, hung from the neck of the Egyptian chief justice, suspended on a golden chain. The “tet” amulet, often fashioned of lapis, was placed on the neck of the mummy for protection in the afterlife. The most popular Egyptian amulets uncovered in ancient tombs are the “ab”, fashioned in the shape of a heart, and the scarab, or sacred beetle, symbol of resurrection, and both were often made of lapis. In the Lapidario of Alphonso X, a book on the metaphysical properties of precious gems commissioned by Alphonso X, King of Castile, León and Galicia from 1252 until his death in 1284, lapis lazuli is considered to be the stone of Venus par excellence, and a help to the bearer in all matters related to romance, sexual relations, and matters of love. In medieval times, lapis lazuli was considered to impart a tonic influence on the bearer, protect the individual from forces of darkness and bring the person closer to the angels and saints, conferring both enhanced energy and spiritual protection on those who carried this sky-blue gemstone. In addition, lapis was recommended to those who chose the path of chastity as an aid in subduing the lower impulses and sexual desire. Lapis lazuli has many metaphysical properties which make it an ideal stone for the modern Lightworker, meditator and crystal healer. According to modern Western crystal healers, lapis activates the throat and third eye chakras, which are associated with the colors blue and magenta, stimulates impulses toward physical, emotional and mental purity, and helps to overcome depression and enhance states of serenity. Lapis assists in balancing male and female energies within ourselves. All these uses for lapis correspond to the ancient wisdom teachings of the East and the West. This crystal has been cleaned with Universal Life Force Energy, and given an energy attunement using Reiki, a Japanese technique of energy healing, so it will continue to receive and transmit Universal Life Force Energy direct from the Source of Creation. It is ready for you to program according to your own needs and desires. Use this powerful crystal with loving wisdom and respect its journey in the Earth for many long historical cycles which has developed its unique metaphysical properties and beautiful appearance. Check out the article Using Quartz Crystals in Digital Technology, Healing and Meditation for an overview of the metaphysical and mineralogical properties of quartz, and a step-by-step guide explaining how to cleanse, charge, and program quartz crystals for healing, meditation and other spiritual purposes, and you can read about Marcel Vogel and his method of crystal healing in that article. Average weight is 4.25 oz. Dimensions above are also average. These bowls are cut from natural stones and may vary slightly in appearance and dimensions. Each piece is guaranteed to be beautiful and to meet with your complete satisfaction!